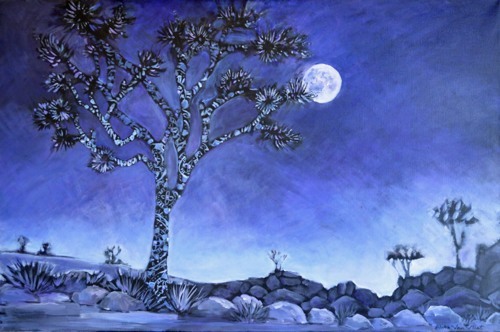 Rich color, luminous moon and a tapestry of pattern on a Joshua tree captures the magic of Joshua Tree at night. 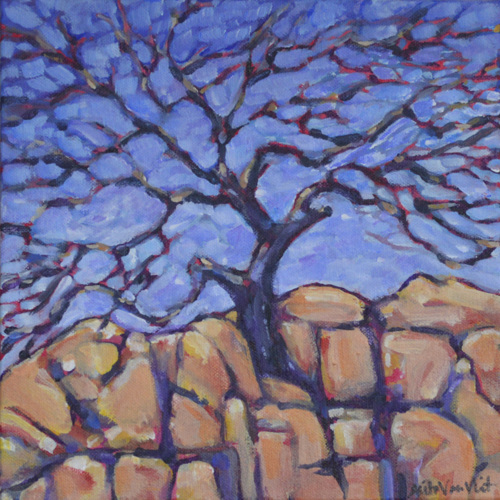 Brilliantly sunny sky and richly colored rocks are backdrop to a Joshua tree painted with a tapestry of pattern. Simply magical! 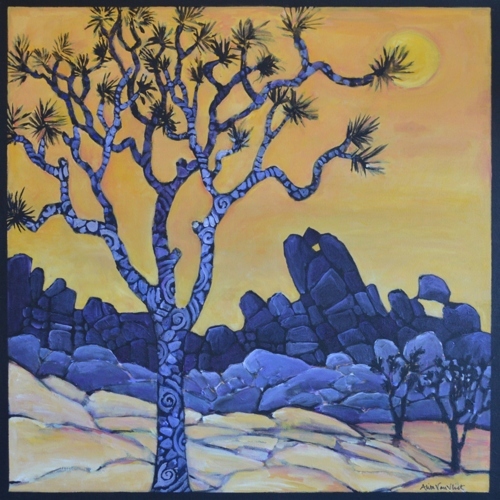 This painting features the iconic Joshua tree. Known for it's irregular branches and spikey foliage, it stands tall against colorful sun soaked boulders and clear blue skies of Joshua Tree National Park. Painted black border creates a three dimensional feel as portions of the tree project forward from the border. 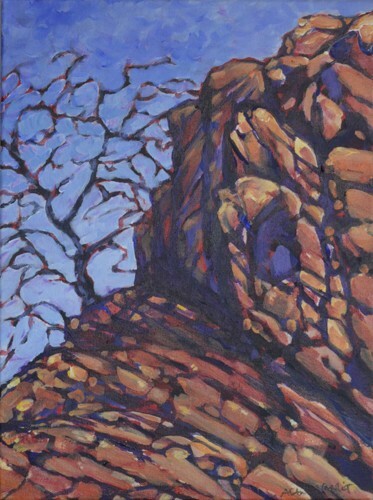 This painting captures the Wonderland of Rocks area of the Joshua Tree National Park. Other-worldly boulders, rich texture, rugged mountains. 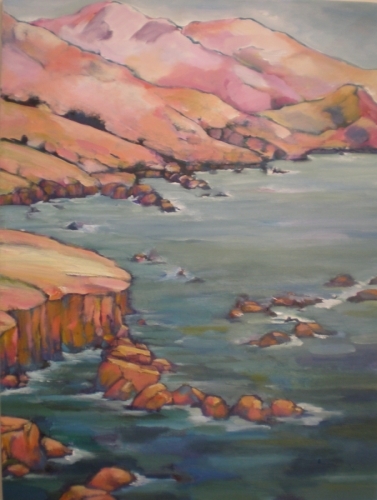 Painted in rich warm tones on gallery wrapped canvas (painted on sides as well) in a contemporary impressionistic style. 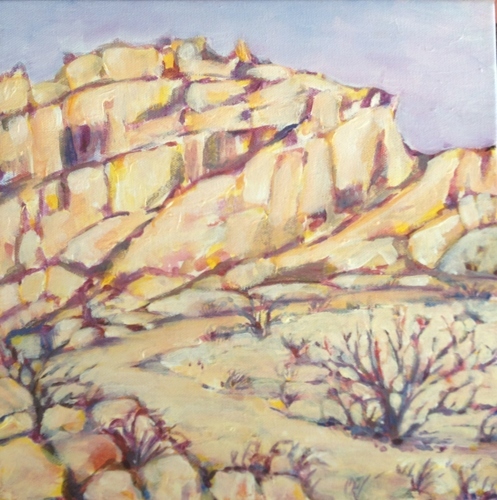 Painted plein air while travelling in the Abiquiu area of New Mexico. This landscape is of a wonderful wash backed by the creamy white rock formations locally known as Plaza Blanco. This river in northern New Mexico is incredible. Cutting its way through the desert landscape, it winds a channel flanked by hills made of colorful earth. 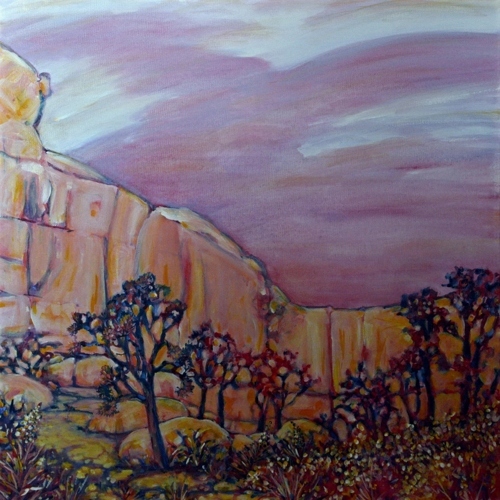 It beckons to be explored, and to be painted as I did on my last trip to the Abiquiu area. Somehow, some way, this tree found a way to take hold and come to life. I imagine it grew for several years, reaching through the cracks for moisture, bracing itself against the desert winds and sun. Even now as I have painted it, no longer in leaf it holds majesty and character. 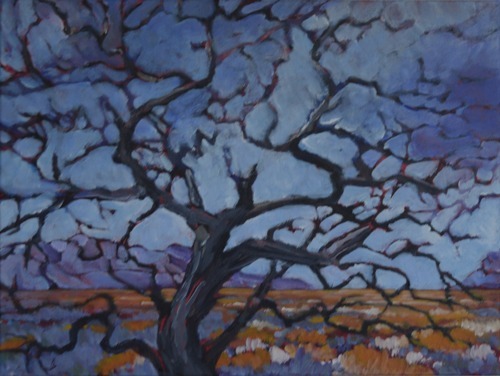 Located in Joshua Tree National Park it's twisted branches against the sky - in harmony with its surroundings. 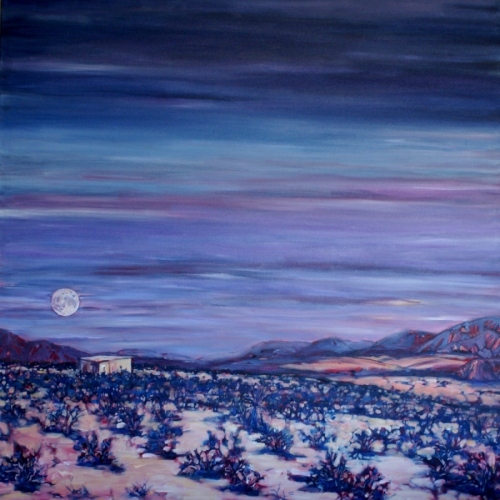 A gorgeous view of the full moon rising over Copper Mountain Mesa where the artist works from her studio cabin. Rugged boulder mountains in Joshua Tree National Park are an unexpected host for a tree to grow. This pine, sitting at the top most peak has most likely been through many seasons, struggling with heat, wind and lack of water. It has managed against all odds and it's skeleton of leafless branches now holds it's place for more seasons as a reminder of how resilient nature can be. A colorful take on magnificent rock formations. Location: eastern view from Intersection Rock at Joshua Tree National Park. 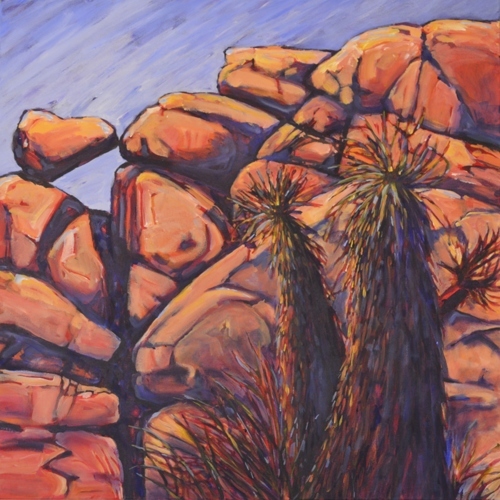 Sun drenched boulders kiss the sky creating a ruggedly dramatic desert landscape full of color and form. Mojave Yucca add to the intensity of the scene. Inspiration: Joshua Tree National Park. 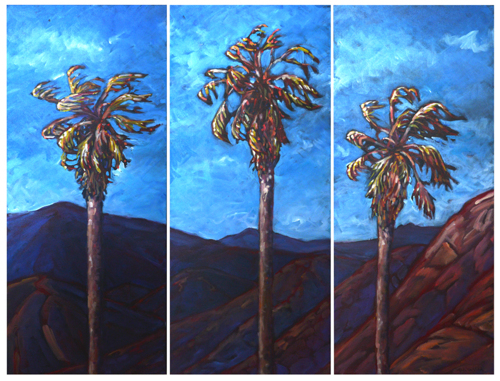 Blowing in the wind, three palm trees are set against a magnificent mountain backdrop. Striking use of color and contrast, each is set into its own 16 x 40 gallery wrapped canvas meant to be hung together as a triptych. A dreamy view of Joshua Tree National Park with a harmonious play on color. 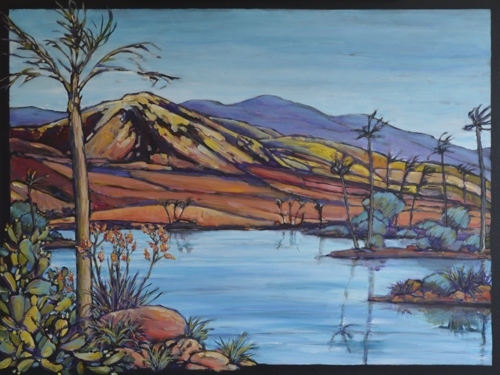 The high desert has it's own unique feel and this painting is intended to capture a state of intense quiet and introspection. 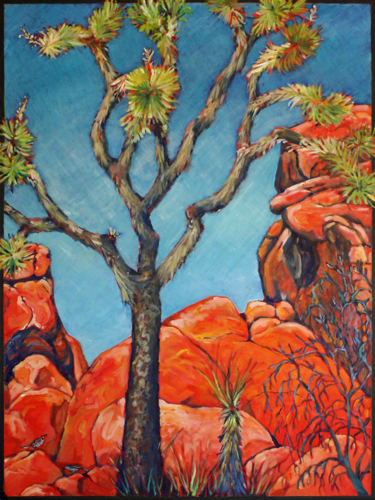 Painted in a cheerful color palette, this painting was inspired by the lower desert region of Palm Springs. It boldly features a beautiful reflective lake surrounded by glorious palms, cactus and red yucca with a backdrop of nearby mountains. 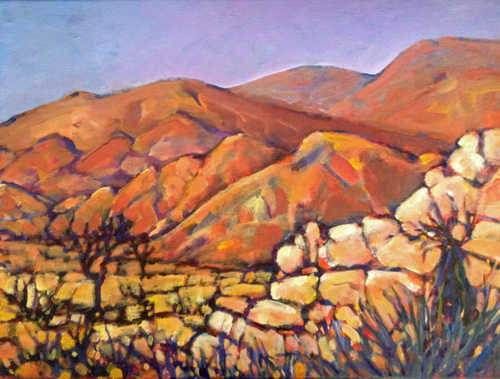 Painted in harmonious shades of warm reds this painting expresses the vitality and strength of the Mojave Desert specific to Joshua Tree National Park in Southern California. Joshua Trees, spiky Nolina and sage brush contrasts against the incredible landscape filled with otherworldly boulder formations. 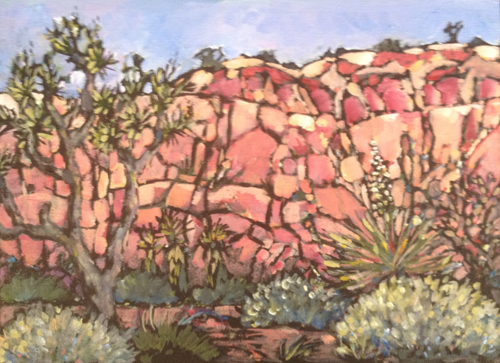 Acrylic painting on canvas of California desert landscape and Joshua Tree National Park. Occotillo, desert marigold and cactus are set against the magnificent rocky outcroppings and mountains typical of the area. 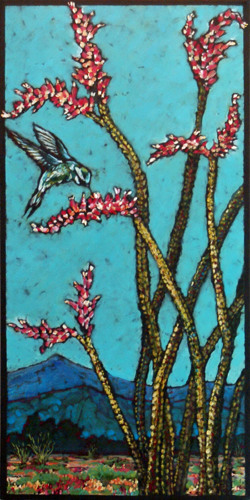 Painting was done using a layering technique in which colors were layered in glazes over a black canvas. Painted frame. Acrylic painting on canvas. This landscape painting captures the quiet beauty of the Pajaro River as it meanders through the coastal farm land of California's Central Coast just before it reaches the ocean. Cattle egret, tall eucalyptus trees and a cloudy sky are reflected in the shallow waters. One of my favorite plants in the high desert is the Ocotillo with it's blend of rugged stalks that rise up to 15' high and it's delicate red and orange flowers. Hummingbirds love these when they bloom in the springtime. This piece was done with an under painting of pure black, then layers of color applied leaving portions of the black showing through. 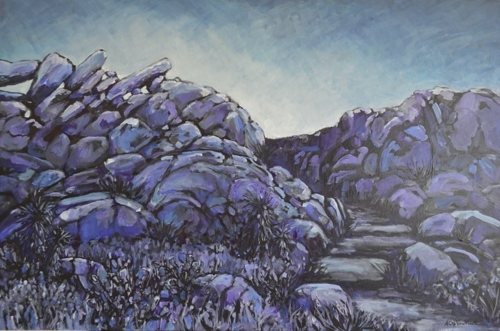 Original is acrylic on an extra deep gallery canvas and measures 15" x 30". Meant to be hung without a frame (black frame is part of painting and extends around the sides). 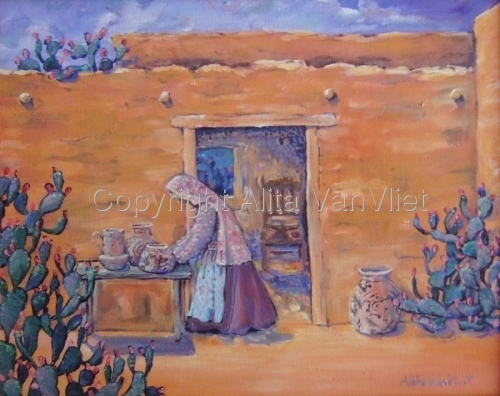 Acrylic painting on canvas of Southwest pueblo scene with native American woman and her pottery. 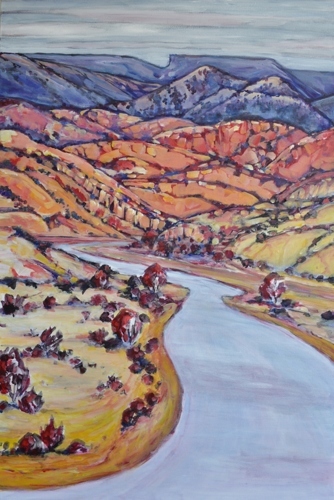 With an impressionistic style, the warm yellows and oranges contrast with soft purples and blues to capture the feel of the ancient traditions of the Southwest and it's people. Requires framing. Acrylic painting on Canvas. This is a view from Rocky Point on the Big Sur Coast looking south along the coastline. Cool blues and purples alongside warm shades of pinks wash over the rolling hills that rise above the waters of the blue Pacific Ocean. One of the most beautiful and captivating spots along this wild section of the California coastline south of Monterey Bay. 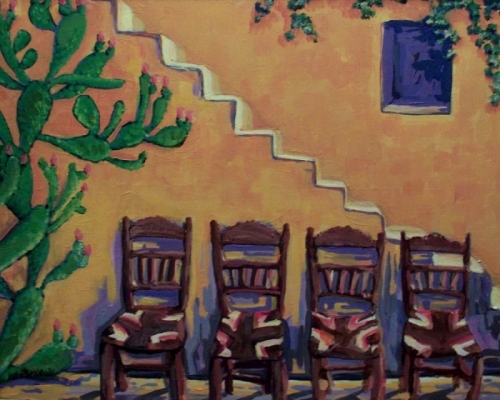 Acrylic painting on canvas with a bold color palette and an impressionistic style captures a simple pueblo scene of the southwest. Four sisal and wood chairs are awaiting the Mariachi band that performs on a daily basis in the plaza with looming cactus, full with it's colorful pear fruit set against rich adobe textured walls. Requires framing. Imagine hiking a trail lit by a full moon. 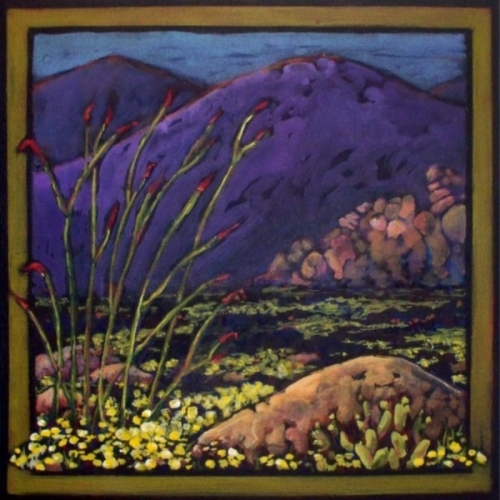 Enjoy the quiet, retrospective qualities as you take each step into a magical place deep in the high desert. This is Joshua Tree National Park at it's most intimate.